Rural health advocates asked state lawmakers Wednesday to help pay for improvements to rural hospitals in up to 42 Texas counties. Without state help, they said, the rural hospitals have no hope of doing necessary renovations to catch up to federal and state hospital codes. 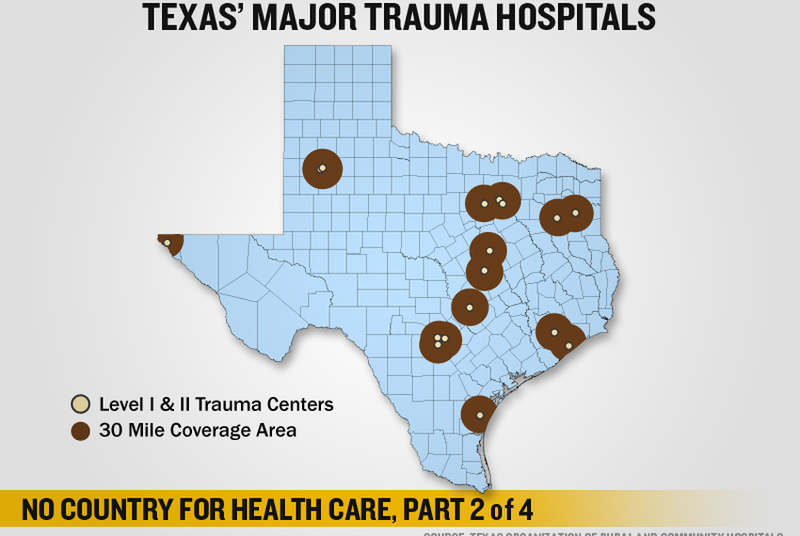 The advocates said shuttered rural hospitals are a concern for all Texans: most of the state's land lies more than an hour's ambulance ride from a level-one trauma center — often called the "golden hour" critical to saving lives, Don McBeath of the Texas Organization of Rural & Community Hospitals told the Senate Finance Committee. He also argued that rural hospitals support the health of Texas farmers and fuel producers, on whom “much of the country” depends. McBeath and his group face an uphill political push. Though senators and other officials call the health of rural hospitals important – Lt. Gov. David Dewhurst dropped by the committee hearing to offer some words of encouragement — the advocates' pleas come as next year's redistricting process could cause rural Texas to lose up to five legislative seats, health experts fear. There's also that looming budget hole of an estimated $18 billion. Committee members were skeptical about the advocates' plan. Under the proposal, the state would allocate $50 million from the general fund to renovate or replace hospitals in up to 42 of Texas' poorest counties. (Collingsworth, Knox and Baylor top the list, with tax bases of less than $200 million each.) Recipient hospitals would have to be at least 25 years old, operate an emergency room and match state money with local funds. Legislators — most from urban areas — picked at the plan. Both Sen. Bob Deuell, R-Greenville, and Sen. Florence Shapiro, R-Plano, said they saw little evidence to assure them the hospitals could continue to pay operating and maintenance costs after receiving state renovation money. Committee chairman Sen. Steve Ogden, R-Bryan, wanted to know whether a “new model” exists for rural hospitals to get up to speed with state and federal safety codes, which they must meet to receive Medicaid and (dropping) Medicare reimbursements. Advocates fear that future revisions to the codes could be the kiss of death for some rural hospitals, whose anemic county tax bases could make “substantial renovations” difficult. With less than $750-million bases, they say, 42 Texas counties fall into that lot.